The folks from UPS have dropped a number of packages at my doorstep over the last few days. The contents of those packages: Six Famicom games I purchased (via eBay) shortly after my birthday. Five of those games--BurgerTime, Mappy, Pac-Man, Sky Kid and The Tower of Druaga (below)--were produced by the fine folks at Namcot. As for the sixth game, well, I'm pretty sure most of you have heard of it. Isn't that banana-yellow cartridge grand? Check out my Flickr photostream (here) if you want to see more Glamour Shot-esque pics of my latest gaming haul. Are you talking about the boxes and cartridges, Nuts? WHOA! I'm kind of in love with the packaging and the branding and everything. Oh my gosh. I'd love to have a coffee table book of shots like these. So cool. Yeah, these early Namcot/Famicom releases were great. I didn't know that until very recently, though. Basically, I played a few of these games via emulation -- Dig Dug, Mappy, Pac-Man -- and after I decided I liked them I went on eBay to see how much it would cost to buy them. That's when I saw the boxes ... and knew I had to have them :) I'm still looking for a boxed version of Dig Dug (and a few other games), but that's OK -- they can wait. As for a coffee book of such shots -- I like that idea! Very awesome additions. You will have lots of fun with the Super Mario Bros of course! And omg! MAPPY!! Thanks, Famicom Freak! Yeah, I'm definitely happy with these additions :) I'm not sure which one makes me happiest, to tell you the truth. Mappy, Super Mario Bros. and Sky Kids will probably be played the most, though. Nice. How many are there? Hmmm, I don't know, Justin. At least 14 -- as Dig Dug II is labeled as #14. 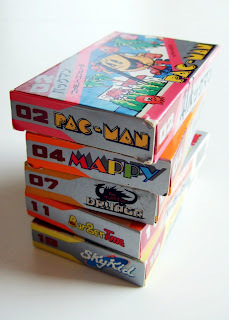 Famicom Fresk or Sean -- do either of you know the answer to this (how many early, numbered Namcot Famicom games are there)? What I particularly like about the Namcot boxed games is that the boxes are the smallest of all the Famicom games. They are just slightly larger than the carts themselves. I'm not sure why, but the size of them just really appeals to me. In answer to your question, I believe Sky Kid at #18 is the highest number in that series! Also, I agree with you 100% re: these Namcot games (and their boxes). They're absolutely tiny, just like Nintendo's "pulse line" releases. Also, the box art (and cart art, for the most part) is absolutely charming. 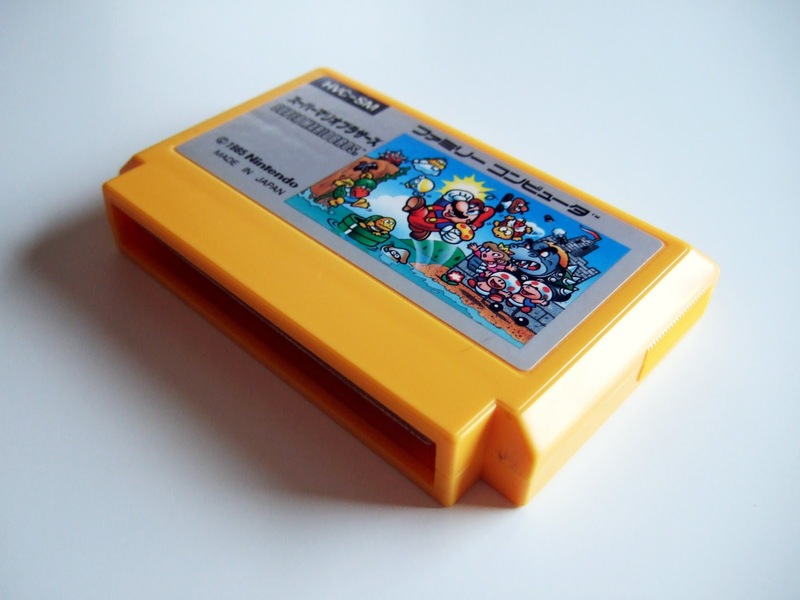 As a Famicom-history aside, I have to say that the sad thing with the Namcot games is that they went from having the nicest boxes in the early years (the ones you got) to the worst of all in their later Famicom releases. Sometime in the late 80s they switched to using bigger, plastic boxes for their games (like the Fami Stadium series). They just look awful. I so much prefer the little cardboard boxes. I hear ya, Sean, and I'll likely stick with CIB games to a point. As for the later Namcot Famicom games being less desirable, I agree with you completely. I'm sure the plastic boxes are more durable, but they're certainly not as desirable as the cardboard ones. And can I ask a stupid question? Why Namcot? Aren't they Namco over here? Where did the T go? Hmmmm, I'm definitely not the right person to answer that, Justin. I know Namcot (as opposed to Namco) appears on some Famicom and some PC Engine games, but I'm not sure why or when they changed from Namcot to Namco, etc. I just asked my wife to translate a couple pages for me. According to this one, Namcot was just a "brand" name that Namco originally used when they started making video games. In Japanese, it would be pronounced (and written) as Na-ma-ko-to. It's not a silent "t" like you'd think it might be in English. I don't know if this was a play on words or something (if you add "-to" to a region name, it means it's a prefecture), or if they thought it sounded cool or what with the two pairs of similar-sounding mora - it doesn't say anywhere that I could find. I don't think it was related to Data East, it doesn't mention anything about that anywhere that I saw. They may have changed it because it obviously didn't translate in English. We'd look at "Namcot" and either pronounce it "Nam-cott" or would leave the "t" silent (because we know Namco now). If they spelled it "Namcoto" in English, we'd pronounce like "Nam-kodo", which just makes no sense. The company name was always called Namco, though. "Namcot" was just the name they put on their games for a while. It may have just been the brand name of their games division. Obviously, this is a company that does more than just make games, so they may have just been differentiating their businesses with a cool-sounding brand name (or so they thought). Hm. Interesting bit of history. Thanks for taking the time to try and explain it! I can't vouch for the explanation, of course -- it just sounds plausible to me. Regardless, you're welcome!